Please join us for our April Showers Challenge at Creative Card Crew! It was so much fun creating a spring card. I had to have a cloudy sky and little rain drops on my card. 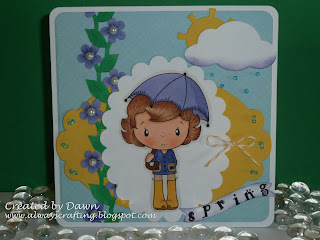 If it is going to be an April showers card there needs to be rain right? LOL Please go over to the Creative Card Crew blog and join in on our challenge. Such a pretty card. Your coloring is perfect and love all the dimension added. Great job! 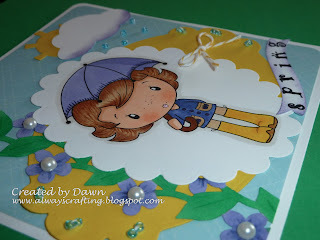 What a lovely card - love those seed beads as rain drops very good idea! Thanks so much for joining us over at Kaboodle Doodles and good luck. Very pretty! Love the image and your coloring is so pretty. Love all the details! Such a sweet card! Love the beads as raindrops & your wonderful flowers with pearl centres! Thanks for playing at The Crafty Pad! Beautiful card Dawn, Love it. You are an inspiration to me, all of your work is great. Beautiful card! Thanks for joining us at Fairy Fun Fridays! Sweet card. Love the climbing vine with flowers. Thanks for joining us at Delightful Challenges. too cute! thank you for joining this weeks Bugaboo challenge at catch the bug! Beautiful card! Many thanks for taking part in the Mami Doodles challenge.